The father of the man charged with setting off bombs in New York and New Jersey said his son underwent a personality change after visiting Afghanistan and Pakistan in 2013. 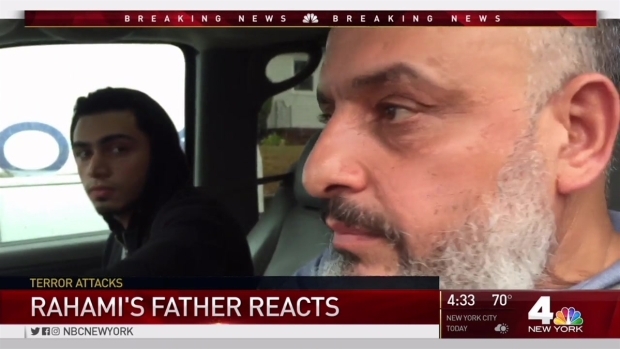 Speaking to The Associated Press early Friday by telephone, Mohammad Rahami, father of bombing suspect Ahmad Khan Rahami, said he told the FBI in 2014 about his son's apparent radicalization after household tensions led to a fight in which another of his sons was stabbed. "I found a change in his personality. His mind was not the same. He had become bad, and I don't know what caused it, but I informed the FBI about it," said Mohammed Rahami, speaking in Urdu. Ahmad Rahami, an Afghanistan-born U.S. citizen, was shot and severely injured during his arrest Monday. He has been unconscious and intubated for much of the time since undergoing surgery, U.S. Attorney Paul Fishman said in a court filing. Prosecutors say the 28-year-old planned the explosions for months as he bought components for his bombs online and set off a backyard blast. Investigators have been trying to determine if Rahami had any accomplices in the U.S. or any contact with militant groups overseas that might have trained him in bomb-making. FBI agents interviewed the father after a 2014 incident in which Ahmad Rahami was arrested on charges — later dropped — that he stabbed one of his brothers in the leg. The FBI initiated contact because the father had expressed concern to someone following that episode over his son's internet use and some of his associates. But in his interviews with agents, Rahami "at no time" discussed his son's radicalization or potential interest in al-Qaida, the Taliban or their propaganda, according to the FBI official, who wasn't authorized to discuss the case by name and spoke to the AP on condition of anonymity. Ahmad Rahami, the naturalized 28-year-old native of Afghanistan hunted in connection with a series of bombings in New York City and New Jersey over the weekend, has been charged with five counts of attempted murder of a law enforcement officer after a gun battle that left two officers wounded, officials said. Ida Siegal reports. When Ahmad Rahami was arrested, prosecutors said he was carrying a journal that praised Osama bin Laden and other Muslim extremists, fumed about what he saw as the U.S. government's killing of Muslim holy warriors and declared, "Death to your oppression." Mohammad Rahami said he and his family were in a state of shock following last weekend's blasts, which injured 31 people. "I condemn the act of my son, and I am sad over injuries caused to people," he said, adding that he was cooperating fully with investigators.